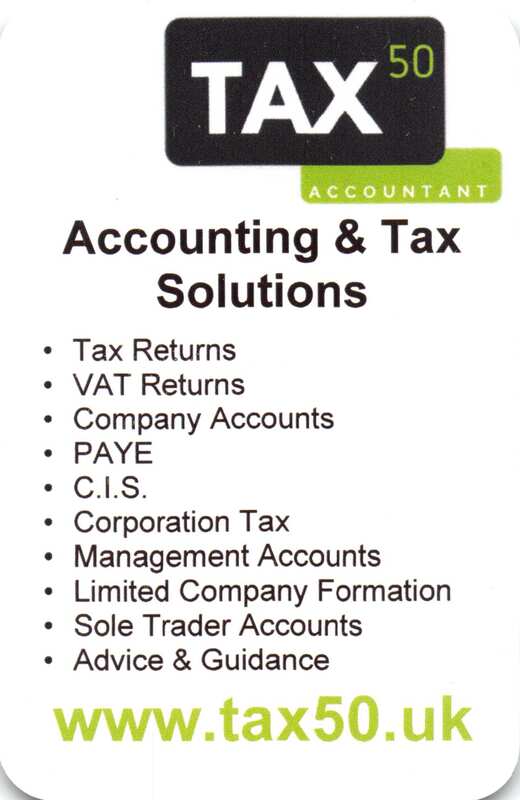 Tax Solutions in Wigan by Tax50. Helping you with Tax. Tax Solutions from Tax50 are designed to help you with Tax. This includes Tax Returns, VAT Returns, Corporation Tax, PAYE (Pay As You Earn), C.I.S. (Construction Industry Scheme) and Capital Gains Tax. Most Importantly for Tax Solutions to be effective you need to get the basics right. Having a good bookkeeping structure will make sure you have accurate information available to adapt as necessary for your requirements. This also means the information is ready when you need it. Not every accountant is the same. If you need help with HMRC then look no further. Tax50 will make sure that you get the best advice. As a result of this you will he a happier person. You need to understand that good Tax Solutions are something that you can start to benefit from financially straight away. Therefore you can move your life along at a quicker pace. Having good Tax Solutions in place mean that you can immediately benefit from the money you save. This means that you can use it in your every day life. A good Tax Solution means that you have a smaller burden on your cash flow. Because of this you have extra money available to make new investments. Good planning is also a necessary part of the Solution. Most importantly you need to take in to account how much money you are capable of earning. This is how you can make Tax Solutions as effective as possible. Contact Tax50 if you have any questions or concerns. Tax50 will give you expert and experienced accounting and taxation advice. The Tax50 team is hear to help you. Because everyone is different Tax50 likes to make sure you understand how the rules of taxation work and how they apply to you with your own personal circumstances. Tax50 is a proactive team of accountants. This gives Tax50 the ability to be more technical than other accountants. As a result of this you benefit from varied and vast knowledge. Tax50 has experience with financial and accounting software and systems (including cloud based bookkeeping software). Other technical benefits include automated reminders and alerts with helpful advice and guidance. Therefore Tax Solutions from Tax50 are revolutionary.